Tempeh is a traditional soy bean (soya bean) product from Indonesia, made from partially cooked and fermented soybeans. It’s made by partially cooking soya beans, usually with other grains and then fermenting and aging the cooked soya beans with a special mould culture that binds the mixture into a firm substance that can he sliced or formed into patties. 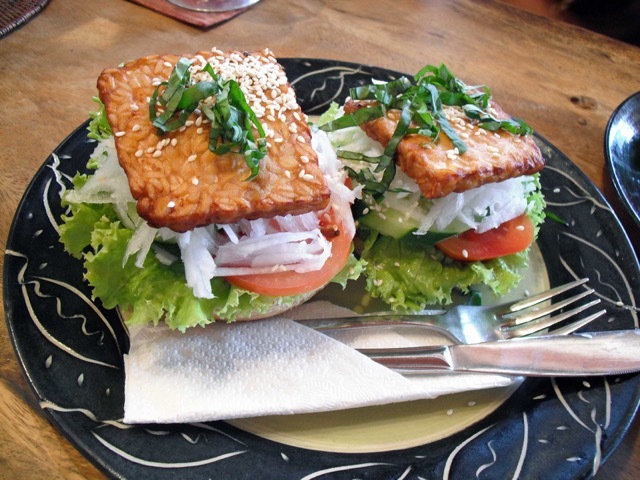 Tempeh contains more protein than tofu and is a bit more flavourful. The flavour improves with age, much like cheese. It can be bought in speciality health stores. 100g (3.5oz) serving has about 200 calories and 8g of fat. It also supplies about 12% RDA for Calcium and 23% for Iron. Tempeh is staple source of protein in the Island of Java. Think of tempeh as a good protein source just like beef, poultry, or pork. Tempeh can be stir fried with other ingredients, crumbled and cooked in a pasta sauce instead of meat; pan fried or baked in the oven. You can use it in sandwiches, burgers, salads, sauces, stews and even soups. It just depends on how innovative you are.